Your rowing technique definitely suffers if flying fish are leaping towards you while you’re in the boat. Luckily this didn’t happen during the Oxford v Cambridge boat race on the weekend otherwise they may have had to restart the race. But it did happen during a Washington University practice session in Missouri, and someone had the good sense to record it. The video showed the scared rowers being besieged by the leaping Asian Carp as they came into dock. A motorised boat alongside them made a quick getaway but they had no such luck and had to put up with the wet fish hitting them in the face. ‘For the varsity guys on land, it was amazing to watch. 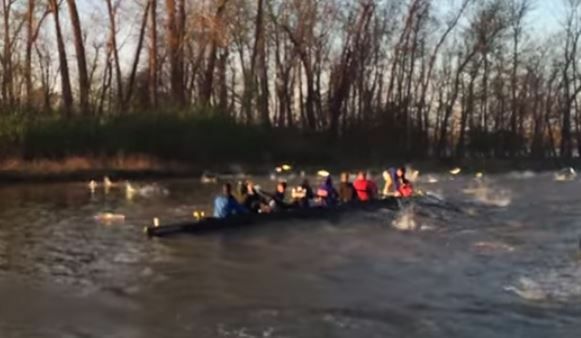 For the freshmen in the boat it was chaotic and terrifying,’ Benjamin Rosenbaum, who was filming, told St Louis Post-Dispatch. Oxford won both the male and female races on Saturday but next year they might want to introduce some flying fish to make things more interesting.